NGD & pics: 2000s Jackson WRXT (Dark Metallic Blue) for CAD$80! SCORE! 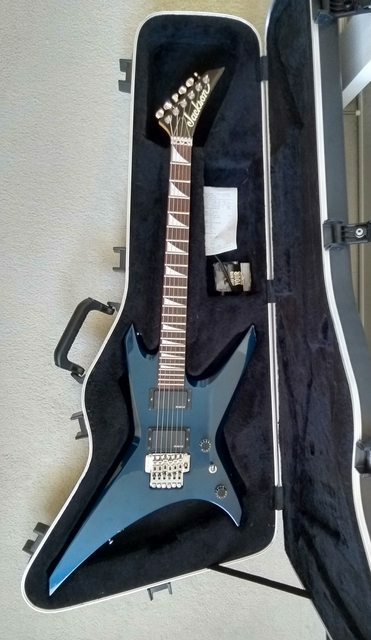 Thread: NGD & pics: 2000s Jackson WRXT (Dark Metallic Blue) for CAD$80! SCORE! Yesterday I bought this 2000s WRXT for CAD$80 (USD$60). My best Jackson deal find ever, and the cheapest Japanese-made guitar I've bought so far. Everything is structurally sound, with only small portions of the finish missing in various areas. Though I originally thought the color was Cobalt Blue, Google Images shows that "Jackson Cobalt Blue" looks lighter than this. So now I'm fairly certain it's Dark Metallic Blue. Speed knobs are not original. I'll likely replace them with chrome dome knobs from AllParts to get back to the original look. The original Duncan Designed pickups are missing but are replaced with EMG-HZ pickups. I need to remove them to discover what model they are. Sonically I imagine this guitar sounding more like its WRMG sibling, which did have EMG-HZ pickups in the early 2000s. I also need to disassemble the neck from the body to find out what the date stamps say. Mudlark or Johnnyryche, please feel free to narrow down the date based on the 9689361 serial number. I did buy deals in 2018, but haven't shown them yet. They're still a work in progress, and they're not Jackson/Charvel related so nobody would care to see them anyway. I wanted to post this WRXT first because it's missing some parts and I would appreciate help sourcing parts that fit. As you can see in the second photo below, the locking nut pressure pads and screws are missing. Will the AllParts "BP-0116 Nut Blocks for Floyd Rose® Locking Nuts" fit? And are the undersides of the pads "radiused" correctly to match the Takeuchi locking nut that is already on this guitar? In the fourth photo, you can see I am missing the saddle lock blocks for the 1st and 2nd strings. (I have no idea how the strings are still in place without them.) Will the AllParts "BP-0114 Saddle Block Inserts for Floyd Rose® Tremolo" fit? I have no idea if the Takeuchi saddles on the guitar are made to similar dimensions as Floyd or Schaller trems. The sixth photo shows the location of the output jack. Its location affects playing this guitar in the classical position, and the appeal of the Warrior shape is that it's supposed to be comfortable playing it in both positions. I was expecting it to be a Strat-style jack on the upper wing like on a WR1. I suppose the WRXT's status as an import meant they wanted to keep costs down have the the jack located closer to the controls, instead of routing out a channel to the upper wing like on the WR1. EDIT: Just came back from buying this used Yorkville YEC-6HV oversized hardshell case for CAD$70 (USD$53). Some good purchases this weekend. 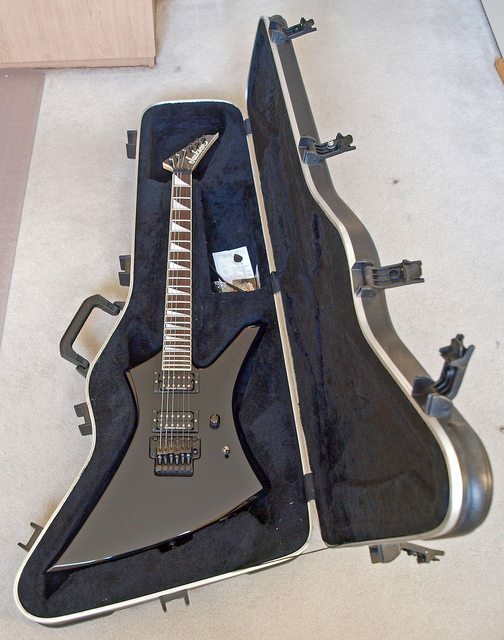 I've had one of these cases before, to accompany the 2013 JS32T Rhoads I briefly owned. Just for fun, here it is in my SKB 2996102506 Jackson KE/WR Case that came with my 2009 KE3 Kelly. The case cutouts actually fit the Warrior shape better than the Kelly shape. The KE3 shifts around inside a little bit, while the WRXT is snug. For comparison, the Warrior on the left, the Kelly on the right. Last edited by Number Of The Priest; 02-10-2019 at 02:58 PM. Hard to pass that deal up, especially for an MIJ Warrior. Warriors seem to be among the least seen body shapes. The serial should be 2002, maybe early '03. Congrats on a great score! Would love to find a warrior priced like that. Sorry, can't help you with the serial number as I only keep track of USA select Jacksons. Bus is your color "DMB" or Deep Metallic Blue if I remember the color chart from the catalogue? Thanks guys. Thanks Mudlark for the date! I'll update after I disassemble the guitar and you can add the precise dates to your database. 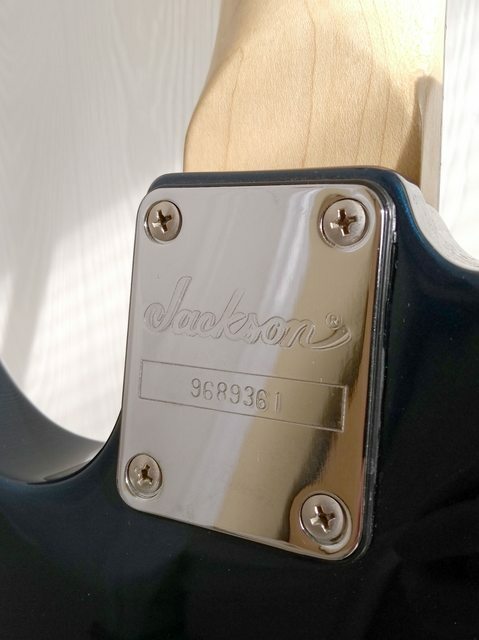 2003 Jackson catalog (https://downloads.ctfassets.net/4jcp...03-catalog.pdf), page 26 of 27 of the PDF file, shows the finishes offered at the time. "Group B" has CB which is Cobalt Blue. "Import Only Colors" has DMB which is Dark Metallic Blue. There is also a DCB which is Deep Candy Blue but was not a finish offered on the WRXT according to https://guitarinside.com/Jackson_Warrior_WRXT. Love that color. 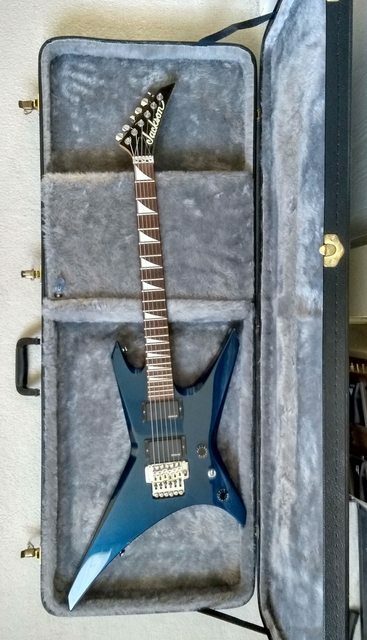 The first Jackson I ever owned in the early '90s was a Kelly Standard, and I'm pretty sure it was that same shade of blue, whatever they called it at the time Deep/Dark Metallic Blue. Speed knobs are not original. I did buy deals in 2018, but haven't shown them yet. They're still a work in progress, and they're not Jackson/Charvel related so nobody would care to see them anyway. Did they just pin the ball ends with the lock screws? On the bright side, after I remove these speed knobs, I will have two spares for my Les Paul Custom. On closer inspection, you're right, the lock screws are pinning the ball ends. Full sized pic: https://i.imgur.com/OJ14OYO.jpg I have no idea how secure it is and I don't dare bring the guitar up to full pitch (currently the trem angle is sunken into the body) lest the ball ends suddenly release from the saddles and whip the strings out at high speed, slicing me to death. This meant that I bought the guitar without actually playing it, which wouldn't be the first time. You stole that Kelly case! US$1.85 correct? Last edited by Number Of The Priest; 02-12-2019 at 07:52 AM.